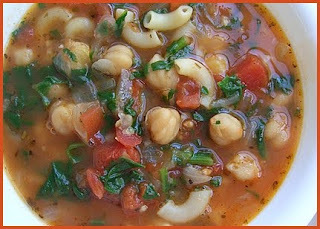 I love this soup because I always have the ingredients on hand during the summer. Plus, as a bonus, it's a huge favorite with my kids (because I used to put "ABC" noodles in when they were younger!). I guess it's basically a type of minestrone but I've never called it that because I don't like minestrone. Kidney beans and I do not get along. However there are no kidney beans here. So maybe it's not really 'minestrone'. I digress. Call it what you want. At any rate, this is great when you have a garden full of greens and tomatoes to use up, and even with the chick-peas and pasta, it's nice and light, perfect for a summer supper. Experiment with the beans and vegetable amounts and types, I've even used zucchini in it with great results. 2 cups finely chopped greens; I use the quicker-cooking varieties here - chard, spinach, beet greens, tatsoi, dandelion, etc. In a large saucepan, cook the onion and garlic over medium low heat until onion is transparent. Add juice, wine and tomatoes and simmer for 20 - 30 minutes or so, until tomatoes start to break down. Add broth, chick-peas and herbs. Increase heat to medium high to bring broth to a boil. Add pasta then REDUCE HEAT to simmer 7 minutes or until pasta is cooked. Add greens and simmer 5 more minutes, until greens are soft/lightly cooked and pasta is done to your taste. Season with a drop or two hot sauce, (for flavor, not heat), salt and pepper to taste. I am getting the urge to bake some bread and this would be perfect with it! I have all sorts of odds and ends I need to use up and they would work well in this soup. I just found your blog and I love it. This soup looks great. I love your blog! I finally got around to making this soup last week so we could eat it Saturday. SOOOO GOOD! Very light, and yet very hearty and comforting. Thank you so much for sharing! This looks absolutely lovely. Thank you. Loving this blog!